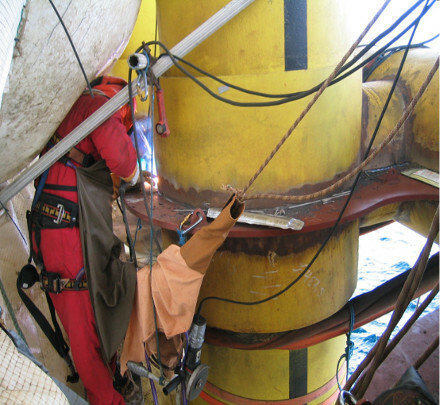 We have personal with extensive experience within the field of rope access, but our employees also have background as mechanics, welders, painters, plate workers and we also have personnel with NDT experience (VT,PT,MT,ET,UT) . This makes us very competent do preform any job at hand. Eagles Solutions is fully committed to Health and Safety, and Environmental issues. Our procedures are in strict accordance with Scandinavian Safety at Work and Risk Assessment regulations. This policy is constantly applied by all our employees, who also ensure that our contractors, visitors and clients are clearly briefed about it. Every incident, near miss and potential hazard that may lead to injury, or damage to the environment, is reported immediately so that it can be learned from. Eagles Solutions emphasises health & safety and environmental protection at every level of its operations, these directly influencing how works are performed.